With the craziness of the holiday season and the flu that does not want to quit our nest, I barely have the time to cook. If ever I needed an easy recipe, this was the week! Stir Fry is my savior. I mix in meat, vegetables and my favourite Blue Dragon stir fry sauce. I have a delicious easy recipe ready in less than 30 minutes. Of course, I usually have meat in the freezer and frozen or fresh vegetables. You cannot make dinner if you don’t have basic ingredients, can you? So make sure to have always those in hand along with Blue Dragon sauces. For today’s stir fry I will be using the Wasabi Plum Stir Fry sauce. I have never used it before because I thought it would be too spicy. Turns out, I was wrong! It is a mix of sweet plum, ginger, soy sauce and wasabi. You cannot go wrong with this mix. Besides my kids love the blend of sweet and sour. 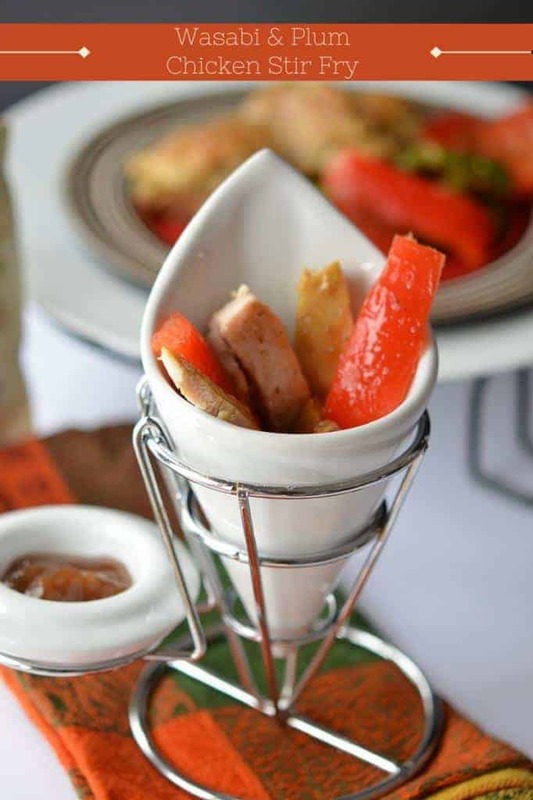 Since it is the holiday season, I decided to serve it in a french fry dish. I never make french fries at home so I never got the chance to use this dish. It was a gift from a co-worker. I thought it added a nice touch to my chicken stir fry recipe. Besides my daughter LOVES eating in nice dishes. Guess I am raising a princess, sigh. This recipe was inspired from Blue Dragon website. The original recipe called for duck and I did not have this meat on hand, so I used chicken. 1 red pepper sliced into thin strips too. You can serve with rice or noodles. 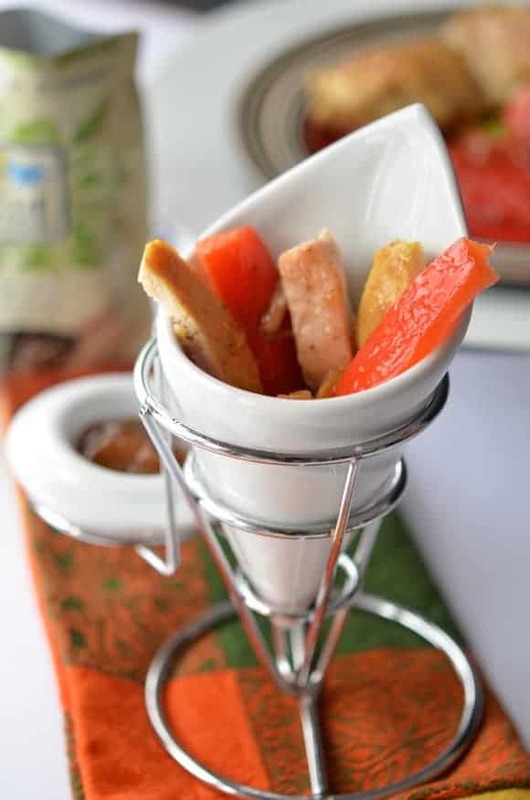 I served in this french fry dish. You would think that the wasabi would be too spicy for the kids but it is not. I loved the mix of the plums and wasabi. It added so much flavor to the chicken. As much as I love chicken because it is a leaner cut of meat, it is hard to season. 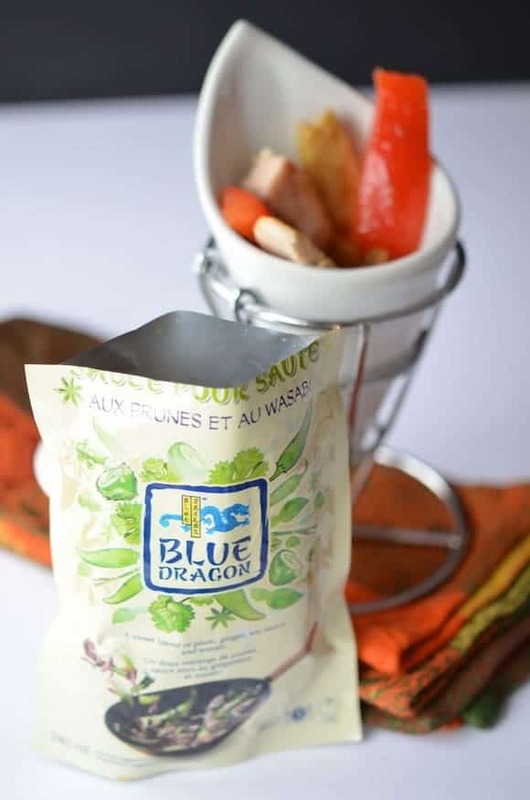 Blue Dragon Stir Fry sauces fixes that and enhances the flavor. Since it was such a hit, I’ll definitely serve it again! Do you have a favorite easy recipe that you use on those crazy nights? How do you like to spice up your chicken stir fry? Disclosure: I am part of the Blue Dragon Canada ambassador program and I receive special perks as part of my affiliation with this group. The opinions are this blog are my own. This looks so good. I love to stir fry because it is quick. I will have to try this. Thanks! Sounds so yummy! And pretty. I like pretty meals. 🙂 Thanks for sharing with Sunday Features! These sounds like it would go well with rice! yum! Wasabi + Plum…omgoodness…that sounds delicious. I just experimented where I created a beef/broccoli stir fry that fit into my current dietary restrictions of no wheat and no sugar. I have never tried this Wasabi Plum Chicken Stir Fry before but will have to try these recipe. It looks and sounds amazing. Thanks for sharing. Your presentation of the food is great. This looks really delish! I want! Oh yum, this sounds great and I love your presentation! Thanks for sharing the recipe, I’m sure my husband would love this so I might just give it a try! Cute presentation of this dish. Great for parties. I really like your presentation, this looks so chic! This looks delicious! I wanted to try this. Sweet and spicy combinations are very yummy! Thank you for sharing this! Looks like your recipe turned out great! It looks so delicious, I’ll have to try it soon! I love chicken stir fry! I like the presentation of your dish! Sounds really good! The heat of the Wasabi paired with the sweet of the Plum I bet is a good combo. Looks like yummy – wasabi, yumm I like that! We like making stir fry in a pinch too. This recipe does sound really delicious. That sounds delicious. I would love to make this for my family!